Thursday was the last day before the weekend. As we were so speedy with our fieldwork this week, we had an office day. To keep us moving and active we decided to go for a swim at lunch, which was so much fun. There is a pool in town which unlike the pools I’m used to was completely empty. We had the entire full sized pool to ourselves. I am used to sharing one lane with up to six people in London or Leeds. So Dillon swimming was an absolute luxury. This stark contrast really highlighted the difference between city and country life. In the afternoon we didn’t have any more work to do so got it off and decided to roam around town. We went for a huckleberry ice-cream. Huckleberrys are a fruit that grows only in Montana and the ice-cream was so yummy. We then sat outside the library under some apple trees and I read my book. It was nice to chill in the sun. As this week was physically tough it was time for another beginning of the weekend treat… The taco bus. 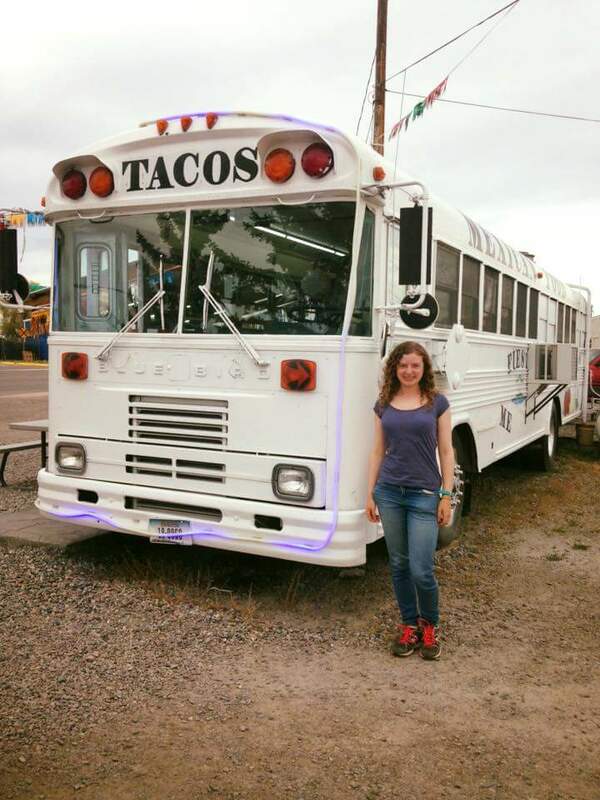 Dillon has a limited choice of restaurants and the taco bus is said to provide the best food in town. I had an enchilada and taco dish. It was tasty. Following this we had time to kill before meeting in the brewery for farewell drinks so went for a drive our work mate recommended. Of course we went the wrong way and ended up in a shooting range field. We swiftly turned around and went to the brewery. This amused our work mates somewhat. In the brewery because I was driving us home I had a root beer. It was revolting, tasted like a medicine, never again. It was a nice evening nonetheless. People got wind of the fact that when I drive the work truck I have to sit on a load of jackets as I’m too small to see out the high up massive windshield. I think I should invest in a booster seat it would be more comfortable and provide more giggles. It’s officially the weekend now and we are off to see cattle branding. This could go either way – lots of people have told us not to go but why not? I am keen to see everything here while we can.